Limited triple vinyl pressing in six-panel triple gatefold sleeve with 16-page full colour booklet. Now-Again deliver the first ever compilation to assess the incredible psychedelic rock, funk and progressive scene of 1970s Jakarta! 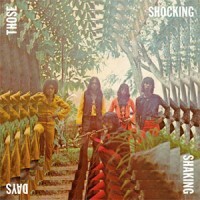 Whilst some collectors fiend for the incredibly rare LPs from the likes of Sharkmove and their later incarnation Giant Step, very little is known about Indonesian rock music - until now. Now-Again Records has teamed up with local musicians and experts to provide a fascinating in-depth look at the flourishing of progressive psychedelic music in early 1970s Indonesia, where fiercely independent musicians criticised the military dictatorship, raised awareness of drug abuse and much more - all to the glorious sound of the fuzz guitar and some of the most ambitious arrangements you’ll ever hear.